As I worked on Sock Knitting Master Class, I found that I wanted to knit every pair of socks. Not only are they all good designs, but each one has at least one lesson in technique or design application. I am certain that anyone who knits all of the socks in the book will end up a veritable master (hence, the words "Master Class" in the title). And who better to give it a go than myself? So, I've decided that I will work my way through the book, knitting each pair of socks (well, maybe with a few exceptions or modifications to suit myself) and hopefully using up some of my stash yarn in the process. I'll write posts about my experiences as I go so you'll get even more insights into these fabulous designs. First off is Cookie A's Asymmetrical Cables (page 48), which are shown in Pagewood Farm St Elias (80% Bluefaced Leicester, 20% nylon) knitted at a gauge of 8 stitches/inch in stockinette, worked in rounds.. In her note on yarns (page 53), Clara Parkes says these socks are best knitted with "a yarn that has three or more plies to render the raised cable pattern." She also suggests keeping to a "solid or flickering semi-solid that won't distract from the flow of the cables." The yarn in my stash that best fits these criteria is Spirit Trails Frija (80% superwash merino, 10% cashmere, 10% nylon; 377 yd/4 oz) in a beautiful combination of blues and teals. I'm certain that I'll appreciate that 10% of cashmere! 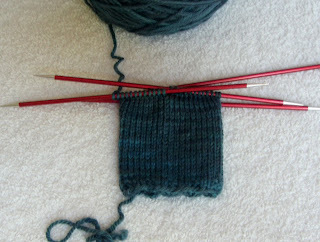 To begin, as I always begin, I knitted a gauge swatch. I get the correct gauge on my Signature size 2 (2.75 mm) needles. I decided to use double-pointed needles because the extra-sharp points on the Signature needles will make easy work of the traveling cable pattern. Tonight I'll cast on for real and start my first sock of this "master" journey. I can't wait! What a fun idea! I wish I had time to knit along with you. And you are so smart to swatch! This may be my 2012 Socks from Stash project... the entire book... Great idea!